Two breaches below the waterline in Pacific Princess' hull have caused Princess to cancel the balance of the ship's current 12-day Med cruise and the ship's next sailing on Sunday. As Pacific Princess was arriving Nice this morning about 6:30am in normal wind and sea conditions, there was an unexpected change in wind which caused the ship to scrape a breakwater wall causing damage to the port side of the hull under the waterline. 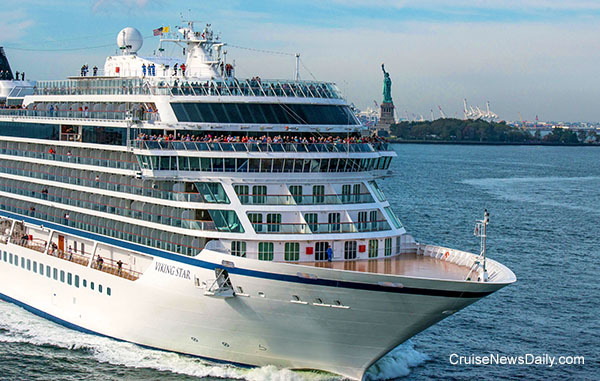 The complete story appeared in the October 14 edition of Cruise News Daily. 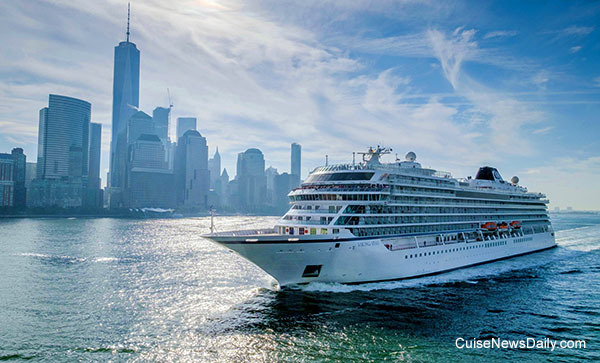 Viking Cruises began their first North American program yesterday when Viking Star made its maiden call at New York. The day before, it made the line's first ever call at a US port when Viking Star visited Boston en route to the Big Apple. The ship will be homeported at San Juan for the winter season and sailing a series of Caribbean itineraries from there. Details appeared in the October 14 edition of Cruise News Daily. Photos courtesy of Viking Cruises. All rights reserved. May not be copied or used without permission. 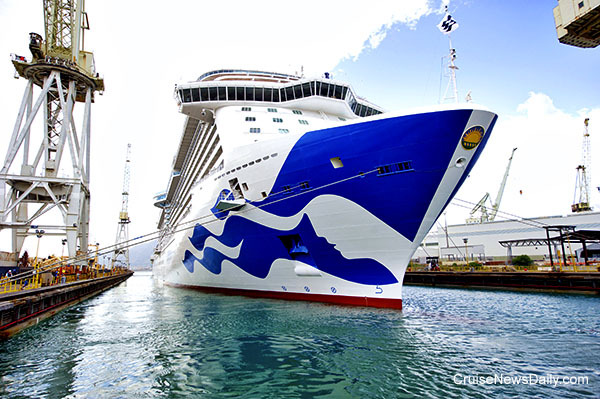 We noted earlier this week that when Royal Princess emerged from dry dock in Palermo, it was the first Princess ship to have its hull painted in the new Princess livery. The time lapse video below shows how it was done. At a press conference today in Seattle, Norwegian Cruise Line said their next ship, a Breakaway Plus-class ship, Norwegian Bliss, will be custom-built for cruising in Alaska. At the same time, the line announced a 15-year agreement to remain at the Port of Seattle and invest $30 million to upgrade the facilities at Pier 66, the terminal Norwegian uses for their Alaskan cruises. 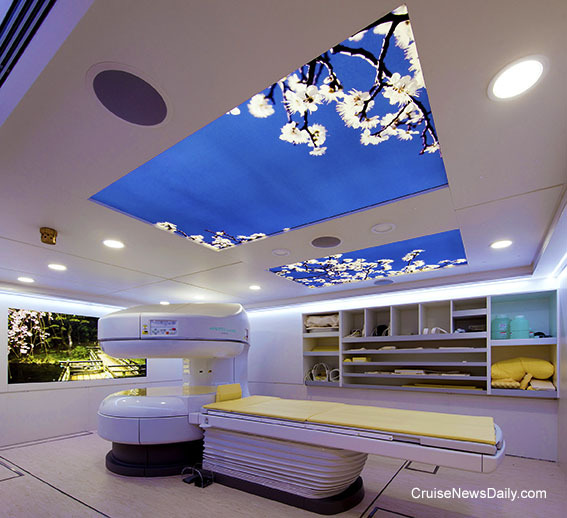 The complete story appeared in the October 13 edition of Cruise News Daily. The Army Corps of Engineers is investigating after Viking Cruises' Viking Star scraped the underside of a bridge Wednesday as it passed through the Cape Code Canal. Viking Star was sailing into Boston from Halifax. The ship is on its maiden trip to North America and the Caribbean when an aluminum mast with a light on it made contact with the underside of a railroad bridge about 7:08pm Wednesday evening. Details appeared in the October 13 edition of Cruise News Daily. We haven't paid much attention to Hurricane Nicole since she has been meandering out at sea, not threatening any land and staying out of most cruise ships' way, but Bermuda is now braced for a direct hit by the category 3 storm on Thursday. Because this is nearing the end of the Bermuda season, Nicole is having little impact on cruise itineraries. Details appeared in the October 12 edition of Cruise News Daily. 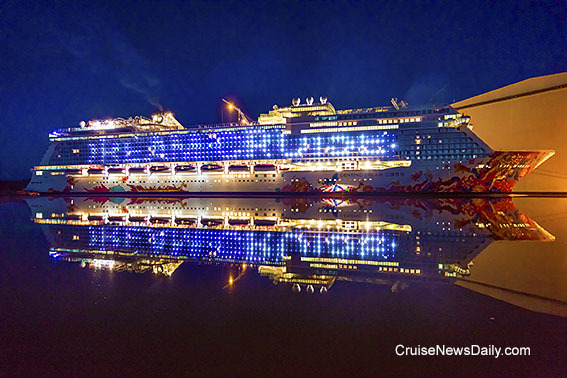 Meyer Werft handed over Genting Dream to Genting's Dream Cruises brand today at Bremerhaven, and began a new era in the cruise industry. We say “new era” because this is the first ship of the first premium/luxury cruise brand created specifically for the Chinese market. The ship will be based in China, and the company is headquartered there. The complete story appeared in the October 12 edition of Cruise News Daily. The special lighting installed aboard Genting Dream can not only create graphic patterns but also put them into motion. Genting Dream has the magnet resonance tomography at sea installed in its spa. This has nothing to do with early voting. Actually, you're very late and just about to miss your opportunity to cast your ballot. The election we're talking about is the election of a godmother for Harmony of the Seas, and voting closes October 14. Details appear in the October 11 edition of Cruise News Daily. Carnival Legend arrived at Sydney this morning after a 17-night South Pacific cruise from Hawaii. The strange thing is that the Australians think she is home, but when she returned to the US this summer, Americans welcomed her home. The complete story appeared in the October 11 edition of Cruise News Daily. Royal Caribbean Cruises Ltd said today they have signed a memorandum of understanding with Meyer Turku to build two new ships for the Royal Caribbean brand, and they will be powered by liquified natural gas (LNG). The Project Icon ships will introduce the use of fuel cell technology to reduce greenhouse gas emissions. Until the first Icon ship is built in 2022, Royal Caribbean will be testing fuel cell technology on other ships. The tests will begin on an Oasis-class ship next year. 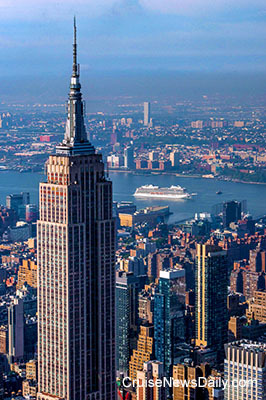 Details appeared in the October 10 edition of Cruise News Daily. Once it left North Carolina, Hurricane Matthew dissipated and never made that predicted turn toward the Bahamas or back to Florida leaving the cruise industry in the Southeast US to get back to normal. Still many ships are sailing modified itineraries this week to compensate for turning around a day late while they waited for ports to reopen. Some of the most popular ports of call in the Caribbean are the cruise lines' private islands and several are in the Bahamas, and we are starting to get reports in about their conditions. Royal Princess was seen leaving the Fincantieri dry dock in Palermo on Friday, the first of the Princess ships to get the new livery. The iconic white hull is out, replaced by a large, blue, flowing Princess logo on the bow. Stunning. 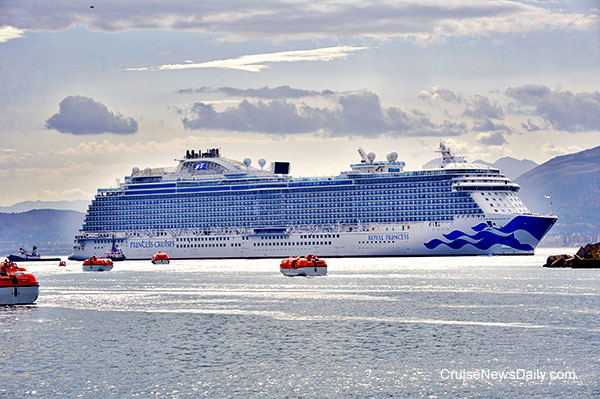 Royal Princess was headed to Civitavecchia to begin her 14-day crossing on Saturday from there to Port Everglades, where she will be homeported for her winter Caribbean season. This story appeared in the October 10 edition of Cruise News Daily. Photos courtesy of Princess Cruises. All rights reserved. May not be copied o used without permission.